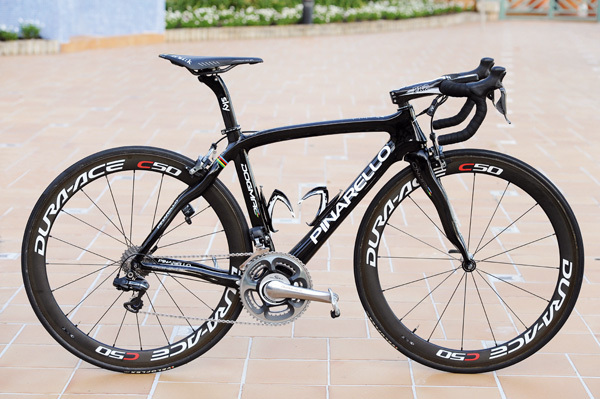 This Pinarello Dogma 2 is the first of three to be sent to the Sky team for Mark Cavendish to race on. He’ll have TT bikes and training bikes too. His world champ edition Dogma is plain black with very subtle rainbow band decals on the Dogma 2 logos, and at the top of the wishbone seat stay. The mechanics have hidden the Shimano Dura-Ace Di2 battery in the seatpin, saying the bike “has to be a little bit special” for the world champion. 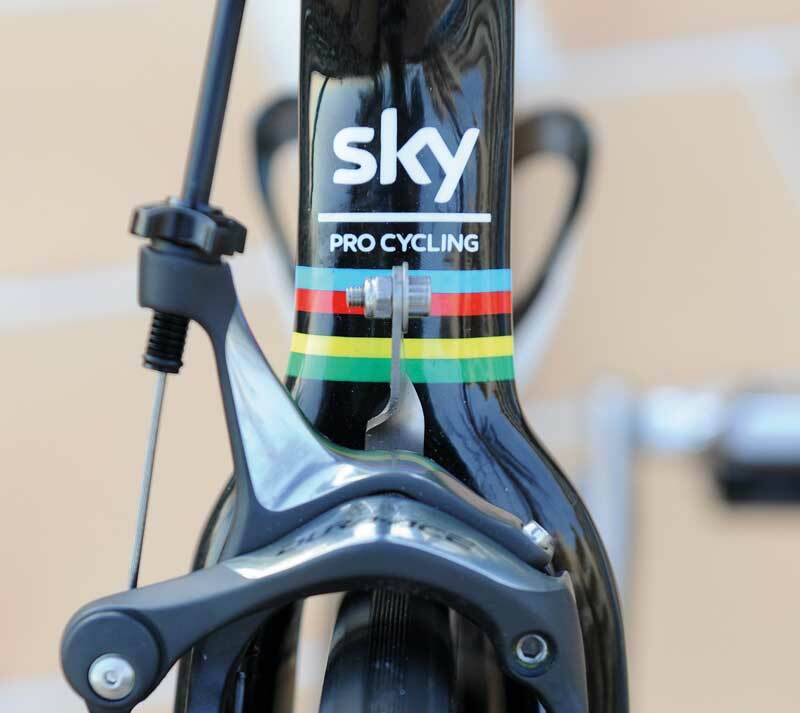 The team has changed from Deda bars and stem to Pro, meaning Cav can use his signature bars and stem. SRM power cranks come as standard on all Team Sky bikes, notice on the end of Cav’s cranks are a set of aluminium Dura-Ace pedals. He doesn’t want to use the carbon versions. The bike came with the motivational statement about ‘riding the line’ on the top tube, but this wasn’t meant to be on there (as the line isn’t on Cav’s bike) so will be taken off the second and third bikes. The chances are, when you see Cav racing, he’ll be on plain black deep section carbon wheels. He likes his Zipp 404s so will use them with the stickers taken off. 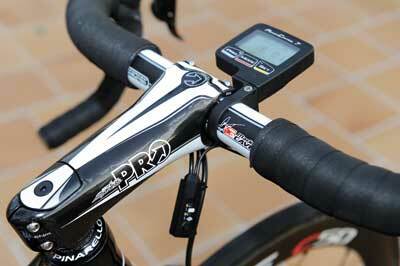 Cavendish gets the electronic ‘sprinters’ thumb shifters added to his bars. The button on the left moves the derailleur up the cassette in to a lower gear, while the right hand button shifts down the cassette into a higher gear. As the name suggests, they’re designed for quick changes when on the drops. Team Sky changed a couple of suppliers for 2012 and Cavendish’s arrival. 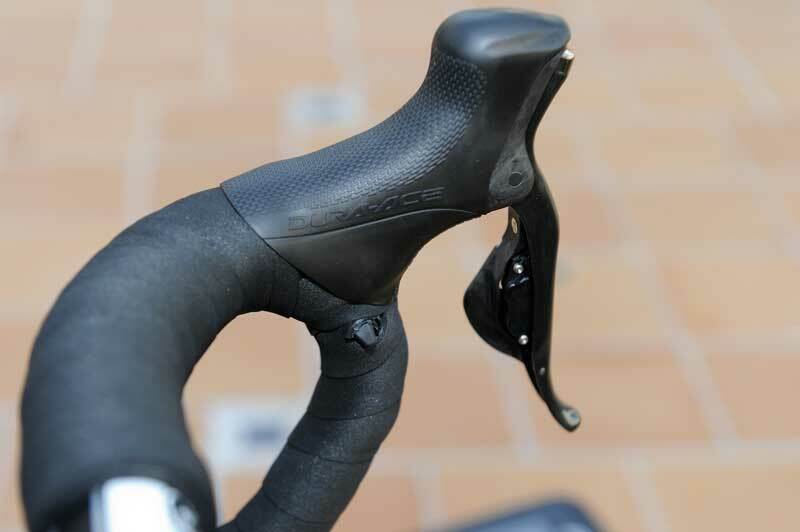 Deda bars and stem have been swapped for Pro (part of the Shimano family) while Prologo saddles have been changed for Fizik. Having Pro components means Cavendish can have his signature bar and stem on his bike. 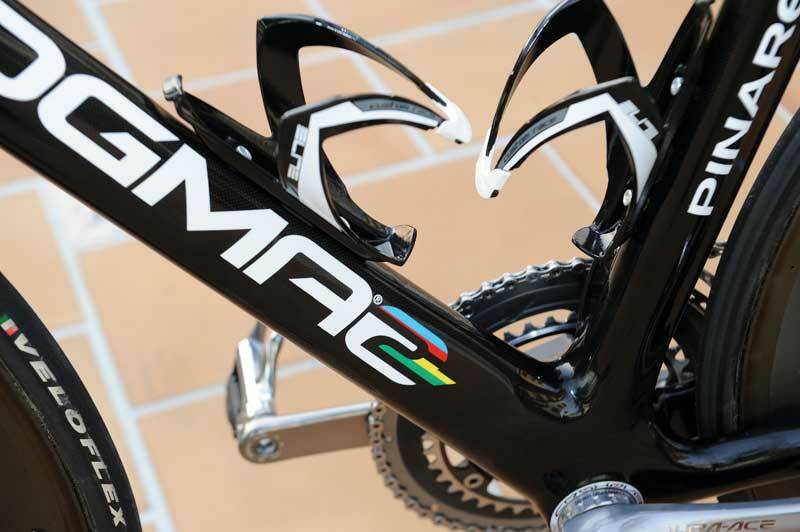 The detailing on Cav’s bike is minimal with just the ‘2’ of the Dogma 2 logo getting the rainbow bands as well as the top of the wishbone seat stay (below).